If you have any responsibility for applying measurement to IT Application Development, Application Support or Outsourced Service supply in these areas this is the book for you! You may be the Sponsor of a Software Metrics program, responsible for implementing such a program or part of a Benchmarking initiative. This book can help you avoid the pitfalls inherent in such programs so that you make your program a success! 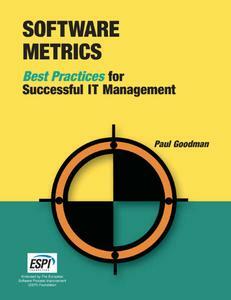 Software Metrics: Best Practices for Successful Management will give you a comprehensive introduction to the subject area. Beyond this, the book provides a wealth of useful case study information and gives a wide range of useful, practical measurement models, based on years of experience across many industry sectors, that you can start to use today. This book is unique in that, as well as giving the technical, subject background necessary to make Software Metrics work, it presents a full lifecycle for measurement program development and implementation. This lifecycle breaks the whole, complicated problem of getting a measurement program up and running into manageable phases; each one defined and described in detail with easy to follow descriptions. Even Function Point Analysis, the break point for many a program, is de-mystified and placed into the context of what it does and how it can work for you. All of this is presented in an easily understood style that assumes no prior knowledge while the experience of the author, gained over twenty years of measurement practice in the IT arena, is such that even experienced practitioners will gain from reading this book.